This project is a baby shower gift for a coworker. Burda 02/2016 #143 is a baby girl dress with front pockets and a slit neckline that forms lapels. The pockets are fully lined (the lining is what shows when folded over). 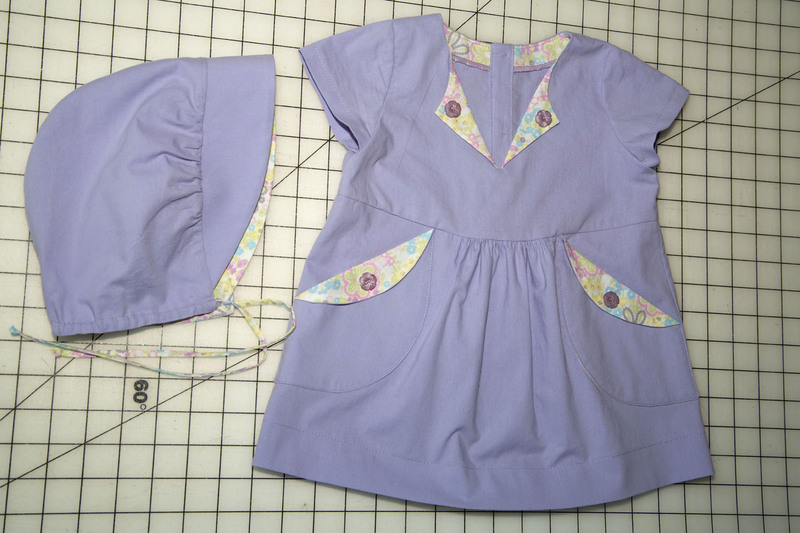 The lapels and folded-over edge of the pockets are held in place with decorative buttons. Burda 02/2016 #146 is a reversible baby bonnet. Since my coworker is due on September 1 – and the weather only gets colder from that point onward – I made these in a 12 month size (size 80 for the dress and 46 for the bonnet) so that her baby can wear them next summer. 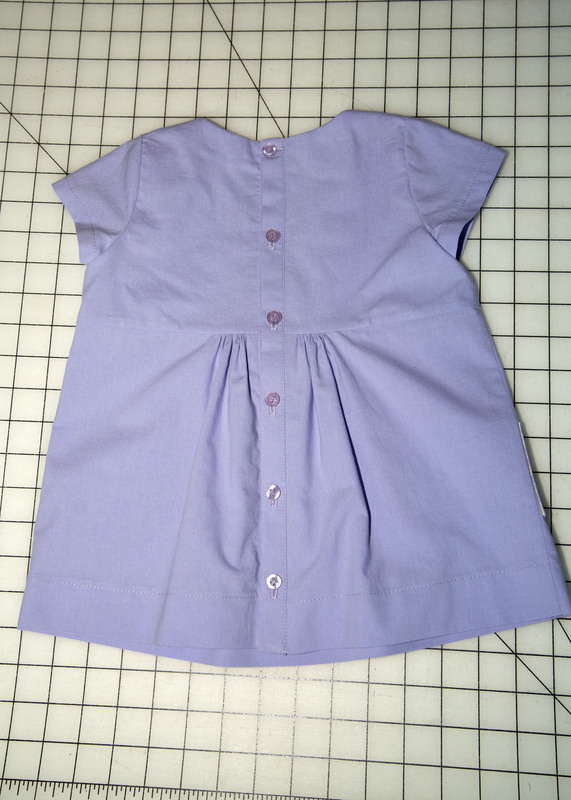 The purple fabric is a lightweight 100% cotton shirting, purchased a little over three years ago from Gorgeous Fabrics. The print fabric is another 100% cotton, purchased more than three years ago from Sawyer Brook. 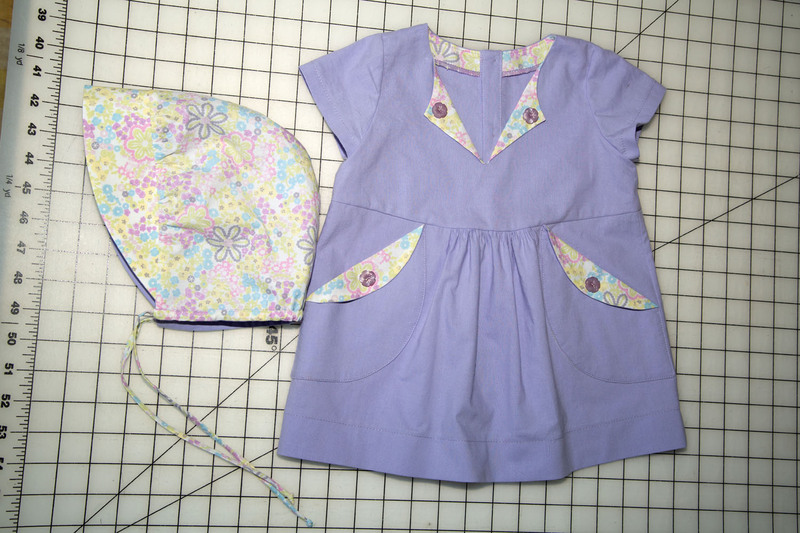 The front flower buttons are from Joann’s, and the back buttons are from my stash. 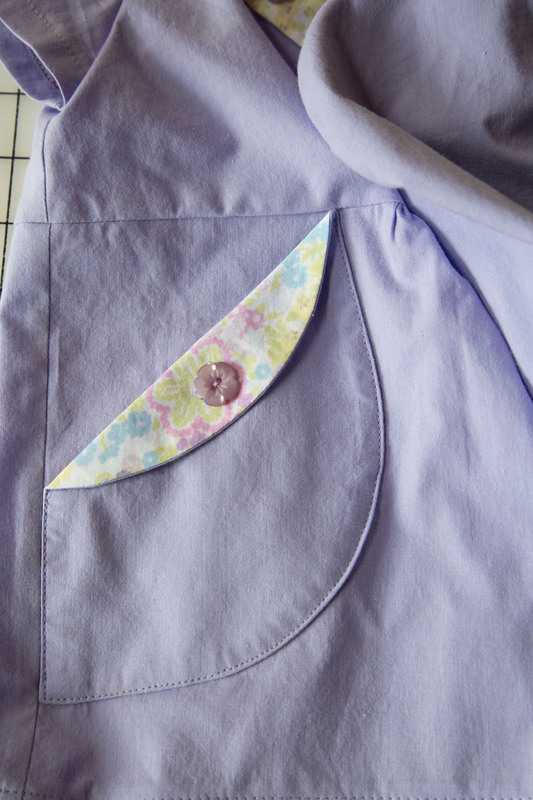 For this project you can use slightly larger buttons for the pocket and lapels, but since the back placket is only a little over 5/8″ wide you need to stick to smaller buttons – these 3/8″ standard shirt buttons worked well. I didn’t make any alterations to either one of these patterns. One thing I would like to note is that for the baby bonnet, they have you make the turn-out opening at the center back seam. I don’t agree with this – after sewing this up I think it would have been more discreet to have the opening at the bottom of the bonnet, where the casing is sewn. This is adorable! Love the fabrics you used. And it’s a great idea to make the 12 mo size since new parents tend to get loads of newborn size clothes that are outgrown within weeks! That’s what I’ve heard other people say – they get a TON of newborn clothes, to the point where they don’t even need to do laundry! Echoing Lisa above, always good to get clothes for an older baby! And this outfit is beautiful! Lucky mom! This is delightful and I am sure it will be appreciated. How sweet – and smart to make it a larger size! I loved getting clothes to fit my babies when they were older. Unrelated question – somewhere you did posts on when/why you used a hand washer/dryer, and I can’t find them. Any idea when they were done? I did a post about three years ago, which I just re-published. I still use the spin dryer, and I’m still happy with it!